Our Biodegradable Carrier Bags are made from certified cornstarch and are 100% biodegradable and compostable. 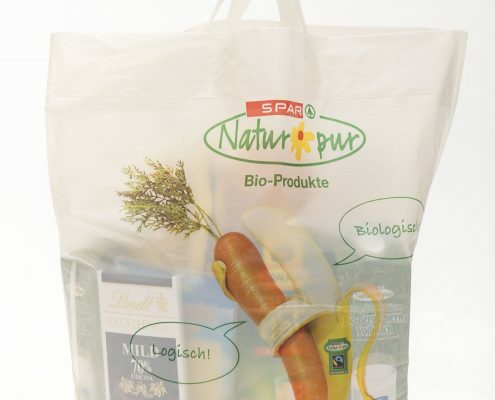 They are a sustainable, resource-saving and environmentally friendly alternative to the commonly used plastic carrier bags. 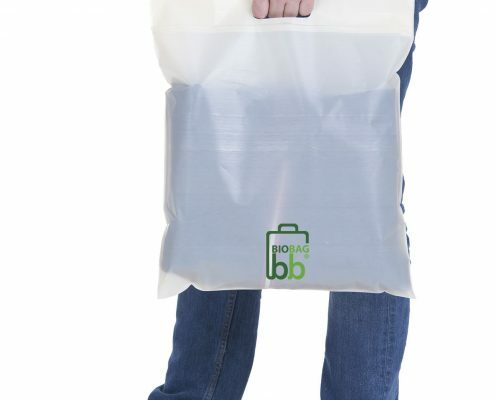 These Biodegradable Carrier Bags are a great eco-friendly way to promote your business. Plastic products are produced from the fossil raw material crude oil and cannot be decomposed CO2 neutrally. Cornstarch is derived from renewable and non-GMO corn and grown in Europe. It is processed into the granulate Mater-Bi®. The granules are sourced from an Italian company who own over 800 patents and received numerous international awards and has won international prizes. 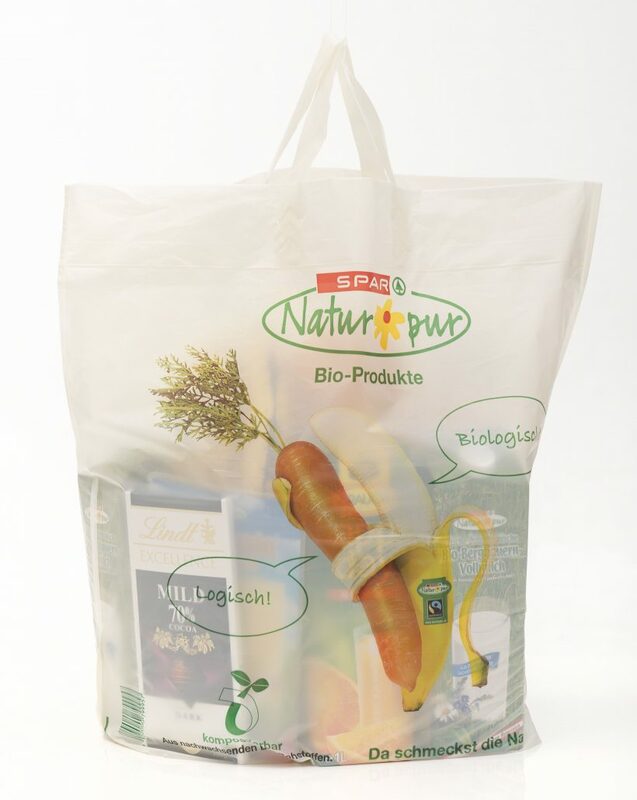 Our Biodegradable Carrier Bags are custom-printed with your brand message. Choose from 1-4 colour printing with 30% colour coverage using Flexo print – an eco-friendly alternative to more common print options. 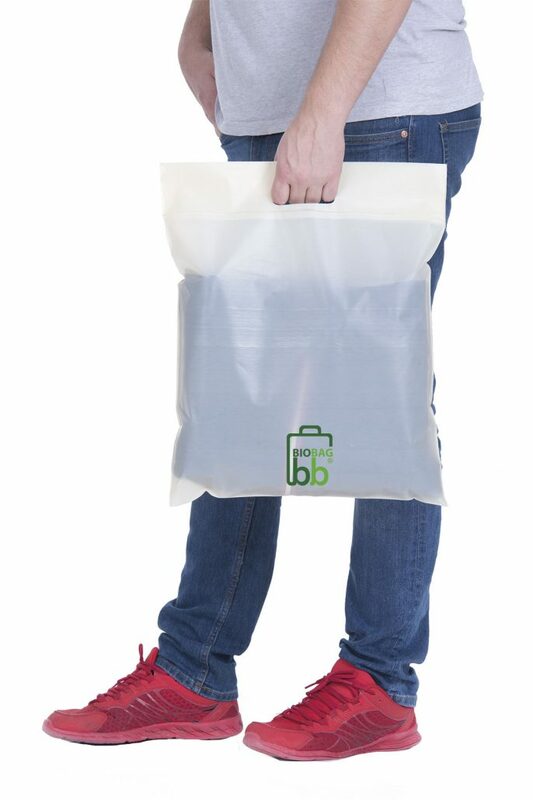 Our minimum order quantity for the Biodegradable Carrier Bags is 5,000. The Mater-Bi® material is 100% biodegradable and compostable according to the European standard DIN EN 13432. The degradation process takes place either in an industrial composting plant, or in the in-house compost, within 8 to 12 weeks with the help of microorganisms and heat. The material decomposes CO2-neutral into its naturally occurring, renewable and non-toxic starting materials. The colors used for the finishing and dyeing of the material are water-based. They contain no pollutants, are odor-free and harmless to your health. The bags can be stored for up to 2 years in a dry environment, protected from light and at an appropriate storage temperature.